Did you investigate the recent news stories about Google putting 14 masterpieces from the Prado into Google Earth, so that you can zoom and pan these great works in extraordinary detail (search for ‘Museo del Prado’ on Google Earth)? Over 3 months Google engineers/photographers took 8,000 highly detailed photos of the 14 paintings and in painstaking fashion they have been pieced together to form magnificent reproductions. Here is a tiny detail from Goya’s picture of Executions on Principe Pio hill. 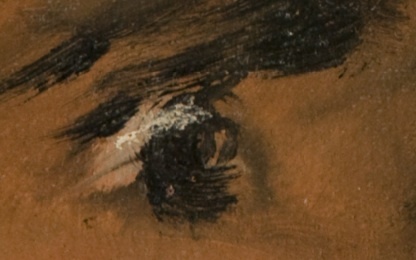 You would need to be peering very close to the picture to see this detail of the terrified eye of the victim. This is a great project and for me it immediately raises the question: “Will Google attempt to do for pictures and the world’s great art what it is now doing for books and all the world’s published literature?” Namely: will Google capture all of art, the contents of all museums in image form and render it searchable and viewable to anybody anywhere? It is a perplexing thought, and I suspect that at some level of detail Google does want to do this. Remember the Google mission: Google’s mission is to organize the world’s information and make it universally accessible and useful. While Google has immense ambition and vast technical appetite, I wonder whether they really can be planning to capture all the works of art held in the world’s museums and galleries. There is an awful lot of it, and surely its unfeasible to track and record it in the great zoom-detail of these Prado masterpieces. And, who, after all, is to say that even this level of magnification and detail is adequate? A thorough and scholarly appraisal of many objects will require even greater resolution and magnification. It also has to be said that it is hard to see great potential for advertising revenues, still less subscription revenues, from a database which captures all cultural artefacts in 2D or 3D high resolution. At some point, the goal of collecting and organizing all the world’s information, becomes an incoherent and an infinite task. Indeed at some point well before that infinite limit, any conceivable or realisable value in the aggregate of all the information in the world runs out. If Google does plan a collaboration with museums and libraries as intensive as the collaboration it is now running with 20 of the world’s leading research libraries, it will have to take on board the principle that selection, focus, metadata, and priorities need to be established before you database the lot. Especially when you are databasing only some of the lot. If Google is planning to put a very large, but necessarily selective, database of art and all museum-worthy objects into a database drawn from the world’s museums, it is interesting that they have chosen to do this through the medium of Google Earth, rather than be a development of Google Images. So you see these high resolution pictures as though you were visiting the Prado, guided to them through an excellent 3D model of the building and indications of where, in which room, the paintings are hung. You do not come at them as you would in searching for ‘Goya execution’ on Google images, where you arrive at vastly inferior reproductions of the same painting, mixed up with other stuff. I suspect that museums and art galleries will do a lot of this sort of work themselves. This virtual Prado does not carry any ads, but let us face it, its a spectacularly good advertisement for the Prado itself. Rival galleries must be envious of the attention this has drawn to 14 masterpieces in Madrid. Similar resources will be free to the public and advertising will pay a relatively small part in the funding process. Google will be much more interested in providing the search services and the indexes for all this curatorship and detailed photography than in actually doing all the heavy lifting. Mind you, if it turns out that museums and art galleries are quite capable of databasing their own collections, it may also turn out that more libraries decide to do a similar job for their own collections. The fact is that the tools used by Google for capturing information held in books, libraries, pictures and museums are increasingly available to us all. Capturing information on your digital camera or your iPhone is almost a democratic right. It will be very hard for companies to build exclusive monopoly holds over information which anyone can collect with a wave of their hand. Adding to your observation that it’s interesting that Google has chosen to put Prado paintings in Google Earth instead of Google Images — As I write in recent article, Google has pictures in many different places: Life Magazine pictures in Google Images, other magazines in Google Books, newspapers in Google News, illustrated books in Google Books.